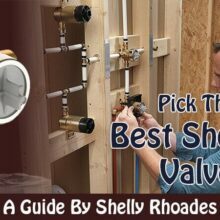 Here’s how to find the best shower valve for your bathroom. You’ll then be able to control the water pressure and temperature, along with other functions. Trying to find the best shower valve for your bathroom can be a real pain. That’s because there are so many of them to choose from. It would have been nice if there’s a standard shower valve for everyone, but then again at least you’ll have lots of options. The plain truth of the matter is that not all manufacturers offer the same kind of quality with their shower valves. Some are simply shoddy, while others work well for a long time. These shower valves may also have different features that make them stand out. There are even different types of shower valves, and one may suit your needs better than the others. So to help you find the best shower valve, we’ve taken the effort to start you off with the top 10 shower valves you can buy for your money. We’ve taken, the most important factors into account, and that includes price. We didn’t limit ourselves to just the cheap choices, but we made sure you’d get a lot of bang for your buck. Moen is well-known for the exceptional quality and durability of their shower valves. It’s not uncommon for owners to replace a Moen valve after more than 2 decades of use with another Moen. This is made of brass, and it’s easy to install. Its 1222 cartridge also accommodates back to back installations. This also has the PosiTemp pressure-balancing control valve that helps maintain both water pressure and water temperature in the shower. That’s due to the adjustable temperature limit stop for the valve so you can control the maximum hot water temperature of the shower. As this is a Moen, it’s designed to last for a very long time. In fact, it even comes with a limited lifetime warranty. So you won’t have to immediately buy another one if you have a problem with it dripping, leaking, or having defects in the finish. This is a valve that’s installed behind the scenes. Many like it as the best shower faucet valve that’s especially made for a Kohler faucet. This is extremely durable because it’s made of brass, and you can expect it to last for many years to come. Unlike other valves with too much plastic, this is all brass and ceramic. You won’t have to repair it all that often either. You won’t have to worry about debris buildup with this valve. That’s very reassuring, as it can handle hard water issues with no fuss. This also features 1-piece ceramic valves. The handles are ergonomically shaped so they’re more comfortable to turn. In addition, you can turn the water on and off with just a quarter turn of the valve. When you’ve turned the valve, it stays where you set it. Just make sure you’re buying from the right seller. You may end up getting used valves instead. It’s not snobbish when you prefer things made in the good ol’ US of A. That’s because you can trust the quality control standards here. That’s not always the case in some countries, especially the ones where the labor rate is so low. With this Delta shower valve, you get a product that’s made right here in the USA. But it’s not just its manufacturing origin that makes this a high-value shower accessory. It’s because it’s a truly innovative system that lets you make fixture changes to the shower head or tub faucet without changing the plumbing system in the walls. That saves you a lot of trouble, time, and effort. So now you can change the functions of the valves and handles, or make changes to the look of the shower, without any fuss. The versatility allows for single, dual, or dual thermostatic cartridges. Along with the appropriate cartridge you also get the screws and sponges you need for easy installation (at least for a plumber). It’s also capable of back-to-back installation. It’s made of brass, so durability isn’t an issue at all. Just so you know, the installation process is explained quite well in the instructions that come with the valve. However, it may require soldering and that’s not easy for everyone. So get a plumber, who’ll find this easy to install. This is made from brass and not plastic, so it’s much more reliable and more durable too. Yet it only costs a few dollars more than a plastic valve, and that means it offers a lot for your money. This Posi-Temp valve is all about maintaining the pressure of the water constant. That’s so you’re not blasted with a harsh jet or suffer a weak drip when other people in the house use the toilet or the laundry machine. It can also help with the temperature as well. It allows you to adjust a temperature limit stop, so that you don’t inadvertently turn the temperature too hot for your liking. Shower burns aren’t all that fun. This is quite durable, despite the 5-year warranty for material or manufacturing details. Basically, if it doesn’t break down in the next 5 years, it means it’ll last for a good long while even after the warranty period. This is a dual function shower valve with a wall-mounted design so that you can have a nice modern-looking bathroom. While the shower body is made of brass for total reliability and long-lasting durability, the outside box is plastic. The box protects the valve body to extend its lifespan. That makes it much better in withstanding the moisture as there’s no corrosion issue. You won’t worry about rust with the brass material either. The bass also doesn’t pollute the water, so you don’t pollute the environment. It’s good news for your skin as well. The dual function of the valve lets you supply and mix hot and cold water to your shower head, whether it’s fixed or handheld. The valve is also made from high quality ceramic, which makes it highly resistant to high temperatures and to regular wear. This also comes with a shower cartridge that contains a pressure balancer. This will help keep the water from getting hot enough to scald you. You’ll find that the valve operates very easily and smoothly. Turning the valve is no problem, and even those with arthritis issues won’t find it difficult. This may surprise you, considering how solid and seemingly heavy the valve may feel when you hold it. Pfister claims this model as their best in-wall valve so far, and it’s truly impressive. It comes with a Plaster Guard cap that you attach before the installation. This cap will make sure that you’ll have a big enough opening after the installation. It features a new brass that’s more durable. The install depth is much more flexible, as now you can do a shallow wall installation instead. It also has a high precision spool balancing unit. There’s a plug for shower only too. As for the durability, it’s not a concern. It comes with a lifetime “Pforever” warranty for both the function and the finish of the valve. 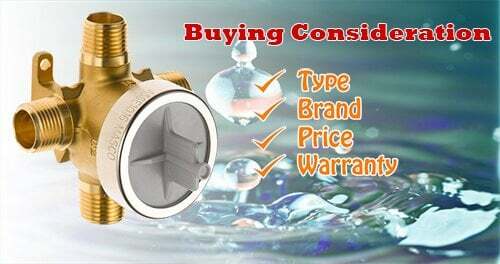 This valve comes with a cast brass body, so that should assure you of its quality and durability. Actually, its construction uses brass, bronze, and stainless steel. Its design allows it to be prefabricated without the need to disassemble the valve, so there’s less room for error. If that’s not enough, then it should be reassuring to know that it’s made in the USA, right here in Braintree, Massachusetts. That should convince you that’s it’s made to high standards. If even that’s insufficient to assure you of the quality, there’s also the limited lifetime warranty for residential use. This is safe to use for water-conserving shower heads, so those who want to limit their shower water use will like it. It also prevents the dangerous change in temperature that can happen to your shower water when someone flushes a toilet. The temperature limit stop can be fine-tuned to fractions of a temperature degree. However, this is just the valve. It doesn’t have the outside trim. You’d have to buy that separately. This is a Kohler valve with the matching trim for all Kohler faucet lines. So if you have a Kohler faucet line, then when it comes to fit this will be the best shower valve for you. This is a temperature control valve, and it works in several ways. This allows you to set an optimal comfort zone, so you can have it working constantly to maintain the water temperature you like. Also, you have a hard high-temp limit stop that makes sure you never get scalded in the shower. The diaphragm design on this valve also keeps freeze-ups from ever happening, which can result from water debris and contamination. The plumber will thank you for choosing this, as the fittings on the valve inlets let you crimp the tubing directly on to the valve with no need to install separate fittings. The universal connections also won’t require additional parts to install this valve. The Germans sure know all about engineering and manufacturing don’t they? The quality of this valve is undeniable, as it showcases Teutonic attention to perfection. This valve comes with the unique “SilkMove” design that ensures smooth valve operations for a lifetime of use. What this is, is a way to guarantee that you won’t ever have to get the shock of your life when the water temperature changes while you’re taking a shower. Now you can’t be punked by someone flushing the toilet when you’re in the shower. This gives you a wide comfort zone that lets you to regulate the water temperature gradually and precisely. No more sudden water temperature changes, in other words. This is a cast bronze valve that lets you adjust the water pressure as well as the temperature. It meets (or exceeds) the anti-scalding ASSE 1016-P standards so you know for a fact that the water won’t ever get too hot for you. Plumbers will also love the fact that it comes with a plaster guard that can be removed quickly, while the brackets are easy to mount. The 1-piece cartridge design also makes it easy to maintain. With its brass and ceramic construction, this will last you for a very long time. So what’s the catch? Well, it does seem like ProFlo made the mistake of making too few of these and the demand for it was too great. That’s why it’s not easy to find, even online. It’s often unavailable. Shower valves haves several different functions, depending on the type of valve you get. Its main function is to regulate the amount of water that comes out of the shower head. You can then open the valve at a level to dictate how much water flows out. Some valves can even make sure the water pressure is constant no matter what. Some valves have the added function of also regulating the temperature of the water that comes out. This valve mixes the hot and cold water, and the mix will determine how hot or cold the water will be when you shower. Of course, you can’t ignore the aesthetic value of these valves. If you get a nice-looking valve, then your bathroom looks much nicer. A shower valve is the part of the shower system that controls the water flow. But it can also control the temperature and diver the water from one faucet to another. For such a simple function, however, there are several factors for you to consider, so you get the right one. Perhaps the most important factor is to get it in the right size, because it’s useless if it won’t fit. The brand is important, so you’re more likely to get a high quality valve. You should read reviews to find out the best shower valves that can last a long while. But the price is important too. You know how the water temperature from your shower head can change when somebody else in the house flushes the toilet? It’s a very unpleasant experience when it happens to you. But that won’t happen at all when you have a thermostatic shower valve. This vale’s main function is to keep your shower water temperature constant even if somebody else flushes the toilet in the house. It’s also frustrating when you’re showering with a full blast of water from the shower head and then it slows down to a trickle. Sometimes the reverse happens, when you have a gentle stream from the shower head and then it turns into an angry jet of water. If you put in a pressure-balancing valve, however, the water pressure from the shower head will remain constant so there aren’t any nasty surprises. This also works as your best kitchen faucet valve. If you have a tub with a faucet, you can use a diverter valve to have a shower instead of a bath. The valve diverts the water from the faucet towards the shower head. This keeps you from having to have extra pipes installed for a separate shower stall. This gives you 2 handles for a single shower head. One handle controls the water flow, while the other maintains the water temperature. This is for 2 shower heads, and it can work for these showers when they’re on at the same time. You have 3 handles, and one of them maintains the same temperature for both shower heads. The other 2 handles offer water flow control for each shower head. This has one handle that lets you control the water temperature. The other handle lets you divert the water from an overhead shower to a slider rail kit. This is like the twin, with one handle as the diverter and the other as the control for the water temperature. However, there’s a 3rd handle which controls the water pressure from full off to full on. How to fix or replace a shower valve? Your best bet is to have a professional plumber do the honors. This is especially true if you have an old house or you have galvanized steel pipes. In these cases you probably won’t have the needed tools to do the job. In fact, it’s actually best if you just leave everything to the pros. It’s considered a rather advanced procedure, and it’s more likely that you’ll get it wrong if you’re not a pro yourself. Here’s what you should do to avoid any problems. Have our list with you when you discuss the shower valve replacement with your plumber. The plumber will help identify which ones will suit your bathroom. You can then pick among them for the best shower valve that offers the features and looks you like. After that, you’ll get the sower experience you want and deserve! If you are a homemaker love preparing food for your family, then you know the importance of having a great kitchen faucet. 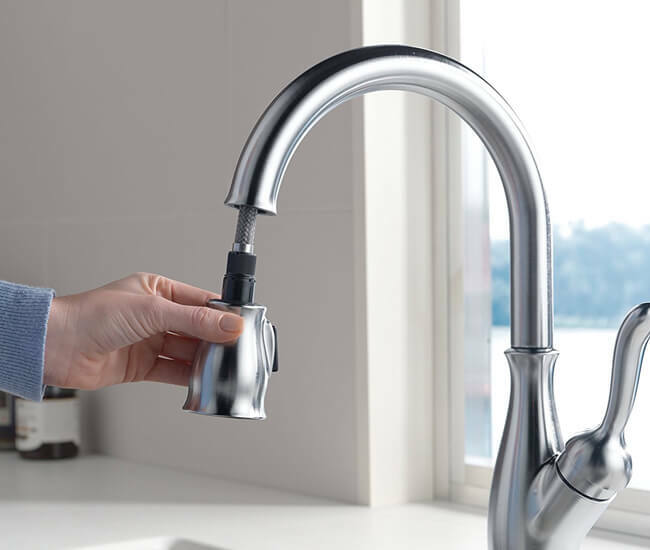 Unlike the old days where a kitchen faucet was described as a simple pipe that has a tap on end, the latest innovations have made it possible to get something that is more functional. Whether you are looking to remodel your kitchen or replace the old faucets, then selecting the best pull out kitchen faucet is a wise decision. This article will give you all the relevant information about the pull out kitchen faucets enabling you to come up with a sound decision. Pull out faucet usually, have a spray head that pulls out towards you. Unlike the pull-down faucets, the spray head is usually attached to a longer hose. 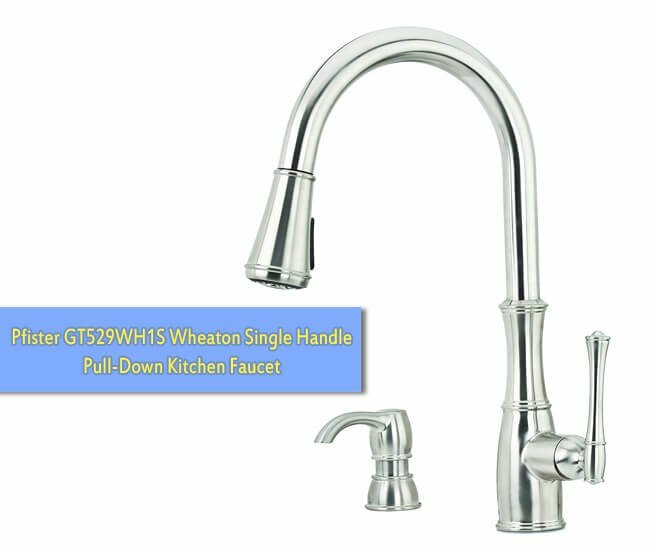 Another difference between the pull-down and pull out faucets is that they are ideal for small kitchen and allows you to fill pots and vessels on top of a kitchen counter. If you are looking to upgrade your kitchen faucet, then allow us to show you the best way you can do it. After doing in-depth research, we have come up with tips to assist you in making an informed decision when it comes to selecting the best pullout faucet for your kitchen. We also understand that very few of us to have the luxury of going through multiple faucets available on the market for them to select the model that suits their needs. For this reason, we have committed our energy and other resources to bring you an all-inclusive guide that enables you to narrow down your choice. 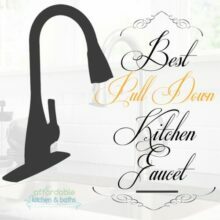 Here are our top 10 best pull out kitchen faucets. Considering all the features that come with this model, this is a perfect pull out faucet for any kitchen. First, we love the Diamond seal technology that makes this unit super easy to install. The technology also ensures reliable performance as it reduces leak points and lasts longer than most of the other faucets on the market. We also love the soft rubber spray while that enables you to wipe away all the lime and calcium buildup with a touch a finger. 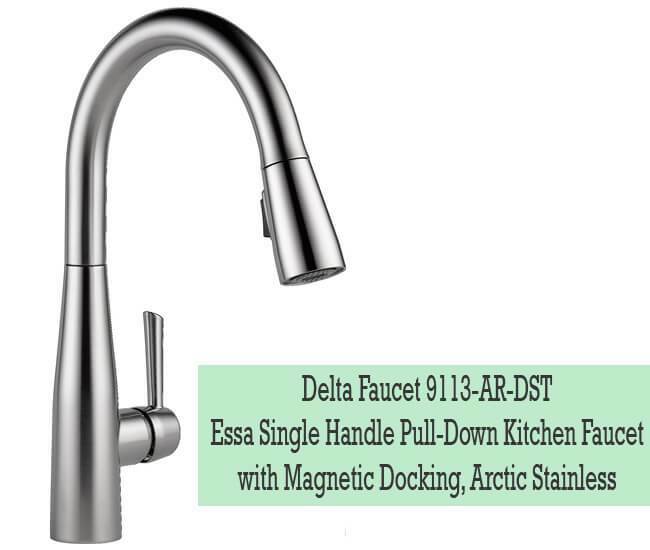 Besides the magnetite docking system make use of a powerful integrated magnet that snaps the faucet wand into place. This faucet is a solid brass construction that ensures long-term service. 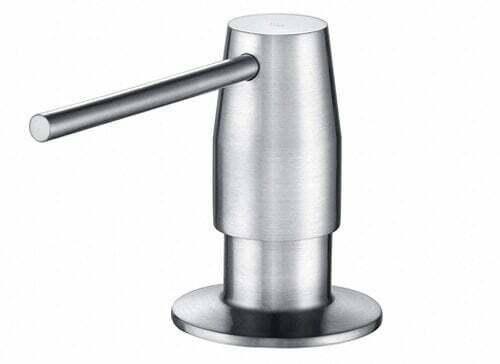 The faucet has a brushed nickel finish that resists scratches and corrosion. This makes the faucet to remain in top working condition for long. Another feature that makes this unit durable is the ceramic disc valve. The pull out design also offers the user with more flexibility to deal with a variety of sink activities. Moreover, you will love the dual function that enables you to do the dishes quickly with the aerated stream as well as powerful cleaning rinse. Avila kitchen faucet is a functional and a simple way to complement any modern kitchen. This is a well-designed kitchen faucet that features a stylish pullout spray wand that enables you to clean and fill your pots with ease. This unit is also constructed using high-quality materials that are free from lead and other harmful material. We also love the dual function pullout sprayer that comes with a powerful cleansing rinse as well as aerated stream. Some of the other features that make this unit to stand out include the leak-free ceramic disc valve that offers you with a smooth operation as well as a simple installation. If you are looking for the cheapest pull out faucet that does not compromise on quality, then this might be the best model for you. The unit features a new design making it a perfect addition to any kitchen. Some of the other features that make this unit to stand out include the swivel spout, durable pull out sprayer as well as quick connector hose we also love the sturdy construction that includes ceramic disc valves; brushed nickel finishes as well as a solid brass nozzle. To make it easy for installation you are provided with all the needed mounting tools and a detailed guide on how to go about the installation. Sometimes the spray does not give a smooth jet of water. 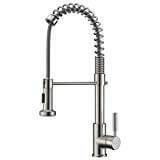 This is one of the most attractive kitchen faucets that we have on the market. Besides its beautiful appearance, this unit offers you with advanced features that make your life in the kitchen easier. The body is constructed using one hundred percent bass making it safe to use. The user also appreciates the coiled spring neck that makes it not only beautiful but also to function flawlessly. Some of the other features that you will love about this unit are the oil rubbed brushed finish that gives you a dark brown finish that has striking lights as well as dark accents. 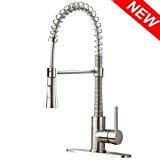 If you would want to purchase a kitchen faucet that brings you a modern touch in your kitchen, then this is it. The unit features three sprays setting including spray for rinsing, stream for filling gas well as pause to avoid splashing. The unit is super easy to operate and provides you with precise temperature as well as volume control. Another great feature about this model is that it has a superior rust and corrosion resistant finish that makes it a great choice for everyday use. This is a popular choice for individuals who would like to upgrade their kitchen to the 21st century standards. 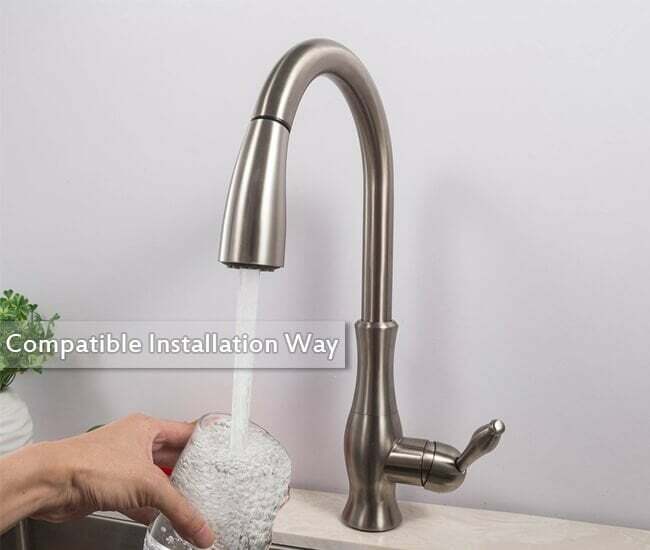 One of the reasons we consider this unit as one of the best pull out kitchen faucet is the elegant design as well as compatibility with various kitchen sinks. 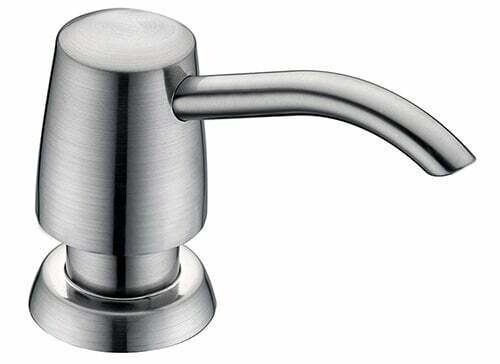 This faucet is easier to maintain and has a solid brass body, which is not only healthier but also durable. Additionally the high arc spout as well as 360 degrees pivoting makes it easier to use. Besides the obvious sleek look, many other features make this faucet a best seller. Unlike other models from the market, this unit has a highly flexible unit that is convenient to use. For added flexibility, the spout has a 360 degrees swivel that offers you with more room enabling you to fill the pots with ease. VAPSINT is not only affordable but comes with a 360 swiveling range making it a great choice for individuals with a double blow a single bowl kitchen sink. We also love the dual function pull-out sprayer that enables you to change from a steady stream to a powerful high volume spray with a single touch of a button. Besides, the durable construction will let you enjoy a service that you can depend on for many years to come. 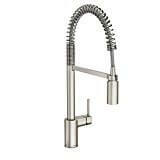 It would be unfair not to mention the Ruvati RVF1215ST C Faucet in our top ten best pull out kitchen faucet. This faucet is constructed using high-quality material, which are resistant to corrosion, scratches, and water stains. The solid brass construction also gives it a long-lasting performance. You will also love the ceramic disc cartilages that prevent leaks and drips as well as the flexible coil spout that offers you with the ability to switch from stream to spray. Additionally, this unit comes with a beautiful finish that will add a modern style to any kitchen. It is also easy to maintain, easy to use and durable. Finding the best pullout kitchen faucets will depend on the functionality you need and personal preference. However, keeping all things constant, the following tips may assist you in finding a model that fits your needs perfectly. Ensure that you have picked a model that offers you with proper functionality and an impressive design that matches your kitchen. If you would want to replace the faucet you are using, you should make sure that you have selected a model that can properly fit into the existing sinkhole. For a multi-hole faucet, it requires more than two holes while a single hole needs one hole for installation. 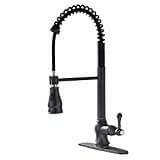 The best pullout kitchen faucet should have a long hose to give you with the flexibility you need in the kitchen. Selecting a model with a longer hose will also make it easy to use especially if you have double bowl sink. 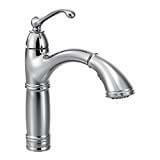 For you to select the best kitchen faucet, you need to go for a brand that is reputable. Well-recognized brands tend to offer you with a faucet that performs well ad last for long. The number of handles should entirely depend on your needs and preferences. Why should you buy best pull out kitchen faucet? 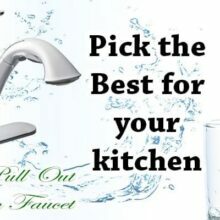 The best pullout kitchen faucets are more useful when you want to fill vessels or pots that are kept on the countertops. 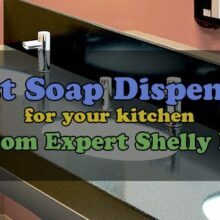 They are also great to rinse off the counter as they feature a spray want. There are many reasons why you should consider having these faucets. This is probably the main benefit that you will get from this faucet. Since they feature, a wand that extends it will be easy for you to fill a pot or any other vessel on top of the counter. Comparing them to pull down faucets, these faucets offer less water splashing. 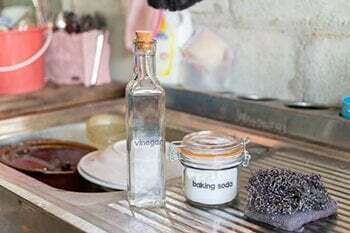 This is very beneficial since it will make cleaning the kitchen easy. The best pullout kitchen faucets have better control features including sliders, buttons, and toggle switches that enable you to control water easily. If you have limited space or have a double sink, then this is the best choice. These faucets have a low profile design that occupies a small space. The best pullout kitchen faucet will not only give your kitchen an impressive look but will also simplify the tasks involved. We hope that our detailed guide has given you a good starting base that will enable you to pick the most appropriate choice. Go through the tips and products listed, look at their strengths and weaknesses, and pick the model that suits you best. If you think of it unless you are that family that likes ordering Pizzas all the time, you spend a lot of time in the kitchen trying to make something that is healthy and delicious. I believe that most good things come from a nice place. It is very rare to get a healthy and delicious meal from a kitchen that looks tired and untidy. However, if a kitchen utilizes the best technology and decent appliance, it is possible to prepare food that is healthy and delicious. Installing the best pull-down kitchen faucet will allow your kitchen to have a classy look and still allow you to prepare your meals quickly. 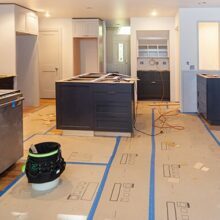 If you are thinking of renovating your kitchen or replacing your old faucet, the following information may help you in finding something that suits you best. After doing in-depth analysis by comparing the various pull down faucets available on the market and considering the customer feedback, we came up with an all-inclusive list of the best pull down faucets on the market. Go through each product and pick the one that fits your needs best. 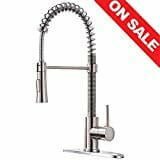 This is a high quality touchless kitchen faucet that adds you convenience of cleaning your dishes and food ingredients without deal with faucet levers. This unit utilizes the motion sense technology that allows it to sense when you need water. The water also stops flowing the moment you remove the item from the sink. The unit is equipped with reflex system that enables smooth operation; secure docking of the spray head as well easy movement. If you are worried about the installation, you do not have to as this unit has a Duralock quick connect system that allows for easy installation. Additionally this unit is designed to be installed through one or three holes and the escutcheon is included. This is another best pull down kitchen faucet that is engineered to make your kitchen work easier while adding a modern touch of style. The faucet features Delta touch2O technology that allows you to simply turn it on and touch it to turn it off. The Tempsense technology will indicate the temperature of water, which is also another great feature that is that, is hard to find. Another impressive aspect about this sink is the fact that you can adjust the flow rate as well as the temperature above the deck. 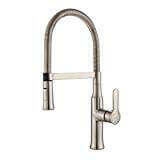 Commercial grade kitchen faucets are durable and can be used for professional use. This unit is constructed using high quality materials that make it capable of handling repeated use in busy kitchen including those in restaurant. This is a perfect choice for someone who is looking for durable faucet that last for years. To ensure your safety, this unit is constructed with materials that are lead free. This means that you will get pure water that is not contaminated with the harmful elements that may leak from the faucet. The faucet also comes with a rust resistant finish. As you probably know, many are the times you are forced to replace a faucet because you find the skin peeling off. However, this unit last for more than ten years and remains in top condition. For those who would like a best pull down kitchen faucet that is affordable and last for many years, we would recommend purchasing this unit. The unit has a brushed Nickel and a solid construction making it a perfect choice for heavy-duty application. The unit is also fitted by a ceramic disk valve and resists both corrosion and scratches for enhanced durability. This sink also features a pullout design that offer you more room for various sink activities. Some of the other things we love about this best kitchen faucet are the dual function pull out, aerated stream as well as powerful cleaning rinse. For those who would like a kitchen faucet that is affordable and last for many years, we would recommend purchasing this unit. The unit has a brushed Nickel and a solid construction making it a perfect choice for heavy-duty application. The unit is also fitted by a ceramic disk valve and resists both corrosion and scratches for enhanced durability. This sink also features a pullout design that offer you more room for various sink activities. Some of the other things we love about this best kitchen faucet are the dual function pull out, aerated stream as well as powerful cleaning rinse. 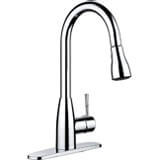 Commercial grade kitchen faucets are durable and can be used for professional use. This unit is constructed using high quality materials that make it capable of handling repeated use in busy kitchen including those in restaurant. This is a perfect choice for someone who is looking for durable faucet that last for years. To ensure your safety, this unit is constructed with materials that are lead free. This means that you will get pure water that is not contaminated with the harmful elements that may leak from the faucet. The faucet also comes with a rust resistant finish. As you probably know, many are the times you are forced to replace a faucet because you find the skin peeling off. However, this unit last for more than ten years and remains in top condition. 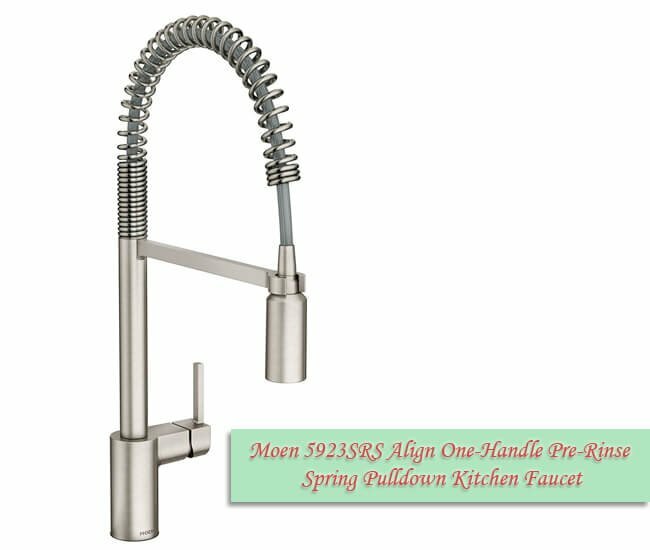 This is another best pull down kitchen faucet that is engineered to make your kitchen work easier while adding a modern touch of style. 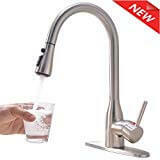 The faucet features Delta touch2O technology that allows you to simply turn it on and touch it to turn it off. The Tempsense technology will indicate the temperature of water, which is also another great feature that is that, is hard to find. Another impressive aspect about this sink is the fact that you can adjust the flow rate as well as the temperature above the deck. 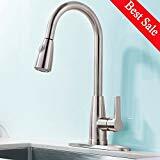 This is a high quality touchless kitchen faucet that adds you convenience of cleaning your dishes and food ingredients without deal with faucet levers. This unit utilizes the motion sense technology that allows it to sense when you need water. The water also stops flowing the moment you remove the item from the sink. The unit is equipped with reflex system that enables smooth operation; secure docking of the spray head as well easy movement. If you are worried about the installation, you do not have to as this unit has a duralock quick connect system that allows for easy installation. 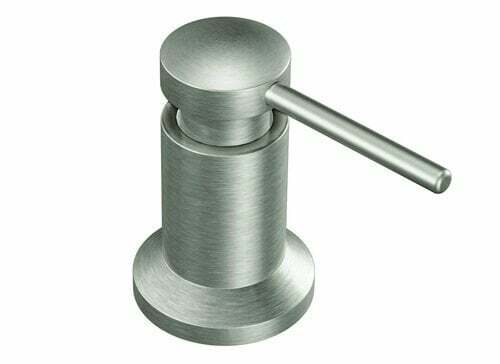 Additionally this unit is designed to be installed through one or three holes and the escutcheon is included. 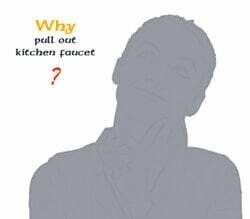 Who should buy pull-down kitchen faucets? KOHLER is a well-recognized brand in kitchen appliances. The brand has been there for more than two decades and has continued to produce product that are reliable. 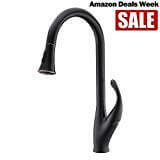 This product is one of their best pull down kitchen faucet that is constructed by a durable and vibrant stainless steel. The unit has an impressive look and offers you with functionality that is hard to beat. The unit also has a high arch spout design that has a 360 degrees rotation allowing you to perform various kitchen sink activities easily. The faucet also features a single control one hole that allow for easy operation and less counter clutter. 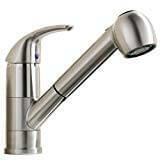 Besides, this faucet has a MasterClean sprayface that resist mineral buildup making it easy to clean. This Sarissa kitchen faucet had a brushed nickel and a PVD processed finish that does not make your kitchen to look fashionable but also makes it easier to maintain. This model from Sarissa Faucet is finished with scratch and rust resistant meaning that the unit will stay in top condition for longer. You will also love the long reach that lets you to reach all the corners of your sink. The long reach also lets you to fill the pots without having to put then in the sink. Additionally you are also provided with a systematic installation manual and all the tools are included. This means that you do not need to seek for expert installation. This unit has a new model for 2017, which will make a beautiful upgrade for any kitchen. Some of the features you will love about this unit are the spring action wan sprayer that toggles between the spray and stream functions conveniently. The unit also has a commercial styled design with the high swivel spout that enables complete sink access. This makes a practical choice especially when washing anything from small dishes to large pots. 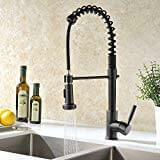 Another feature that makes this one of the best pull down kitchen faucet is the ceramic disc valve that provides smooth turning action as well as prevention of drips. If you are looking for a great value in a pull down faucet, then this might be what you need. The Shaco pull down faucet combines modern aesthetics and efficiency to come up with a kitchen faucet that is great for washing both nonstick cookware as well as stainless steel cookware. To ensure that your health is safeguarded the manufacturer make use of materials that are free of lead. The Solid brass construction ensures durability while the high arch spout as well as the 360-degree rotation allows for practical use in the kitchen. Additionally the 2-mode pull out sprayer that has touch controls that enables you to switch from steam to spray also makes it an ideal choice for any kitchen. 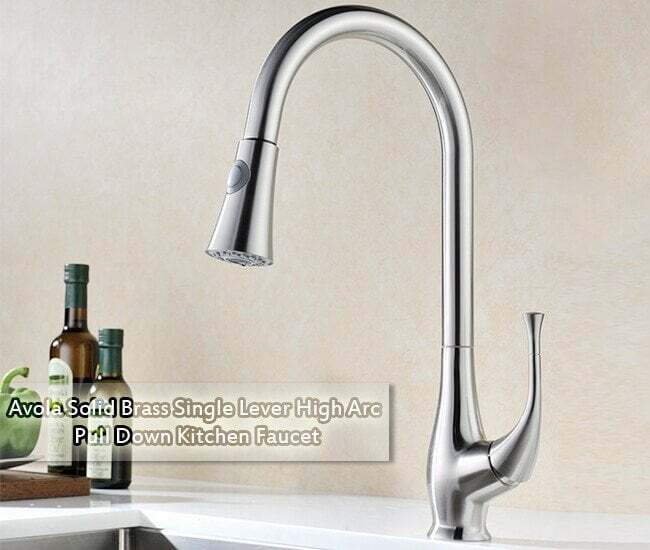 This is another premium pull down kitchen faucet that has all the features you need in a high-end faucet. The unit has a decent height that allows you to clean your dishes as well as doing other activities with ease. We also like the high arch spout as well as the 360 degrees rotation that allows more room for pans and pot as well as superior clearance for the sink. The unit also has a long hose that provides you with a 20-inch reach that also improves your convenience. Additionally the faucet also includes the cold and hot water supply lines. Last but not the least we have this decent pull down faucet from PH7 that is constructed with materials that are a hundred percent harmless to your health. The manufacturer makes use of materials that are FDA certified. The unit also has a high tech docking system placed within the spout that allows for smooth and secure lock of the spray head. The high arch gooseneck as well as the 360-degree rotation also makes it easy for use in the kitchen. 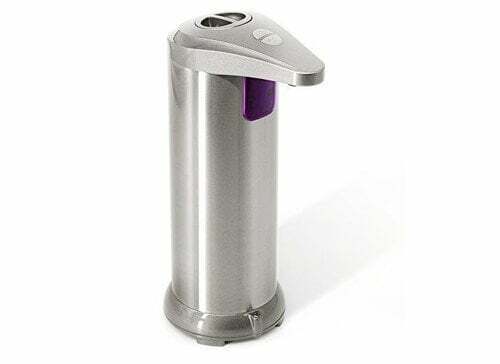 Additionally, this unit spray head has angled nozzles that offer you with a wide and powerful blade of water that sweeps your dishes clean effortlessly. 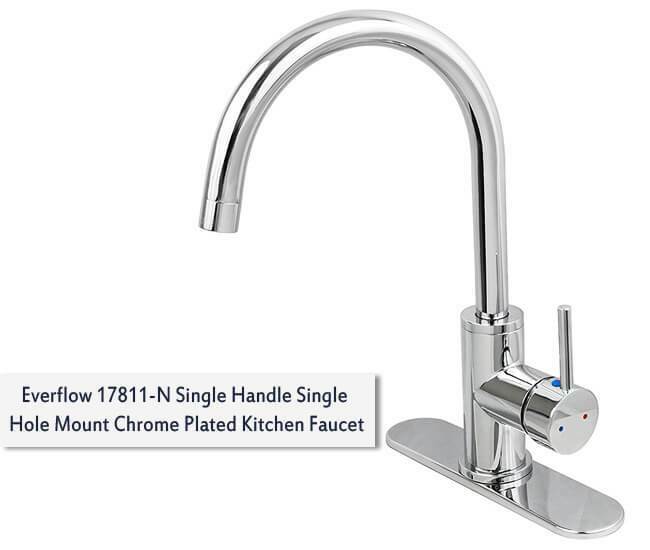 If you are considering upgrading your kitchen and you are not sure the best faucet to use, it a kitchen faucet with a pull-down feature is worth considering. The pull-down kitchen faucets will help you in streamlining the work of preparing meals and cleaning up. This model is an excellent choice especially if you need to fill pots or containers that sit on the cooking surface or counter surface. It is also possible to fill a pail that is on the floor without the use of additional equipment. 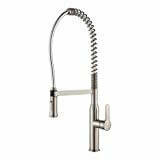 The best pull-down faucet features a detachable spray head that is attached to a hose that runs through the faucet body. The hose has a special bearing that supports the spout making its movement friction-less. This faucet is an excellent choice for individuals with a deep sink and limited countertop space. The pull out kitchen faucets have become very popular, and it is no wonder. They offer the user with multiple benefits when compared with other models, making them more practical to use. First, these models offset the user with a greater variety of spraying options when compared with the pull out faucets. This makes them a better choice for filling pots and rinsing the dishes. These faucets also come with a more ergonomic design than the pullout. With these faucets, you do not require any hose as you just require one simple downward motion. Another benefit of using this faucet is more durable since the hose is less prone to kinks because you will not be using it in a variety of directions, this faucet can last for a longer period. Additionally, the latest pull down kitchen faucet comes with a well-designed head, a dock, as well as a balanced counterweight that allows for a snug fit. These features enable you to accomplish the kitchen tasks. 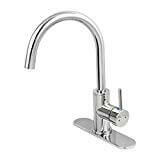 We also have other pull-down faucets that incorporate strong magnets in the spout dock as well as the spray head. This magnet allows you to return the head to its place, minimizing any dangling and sliding. Moreover, if you would want to have a faucet with a separate sprayer, a faucet that has a pull-down spray is preferred. The pull-down design does not need an extra hole for installation and is more convenient to use. Additionally, if you have a deep kitchen sink, this is the most appropriate choice. Using the following tips may mean the difference between something that offers you with a service you can depend on for long and something that breaks down after a few months of use. The best pull down kitchen faucet should be constructed using high-quality materials to ensure that you have a long-term service. Besides being constructed using high-quality material inters for durability you also need to consider your safety. Make sure that the materials are from harmful chemicals such as lead and other toxic materials. Modern faucets have various features that improve their effectiveness. For instance, the addition of touchless technology makes a faucet easier to use. This feature also enhances the efficiency of water allowing you to reduce the water bills. The price also matter. Although well-recognized brands tend to have a high price, it is still possible to find budget-friendly models from the brands also. Additionally, going for models from less recognized brands may also help you to find a product that will give you the service you need. You should also think of your kitchen counter and sink type. If you have a deep sink, pull down faucet will be the best choice. Additionally, picking the Pull down faucet will allow you to have multiple spray options, enhancing the way you do things. Lastly, you also need to ensure that you have selected a finish that goes well with your kitchen décor. The finish should also be rust and scratch resistant for durability. 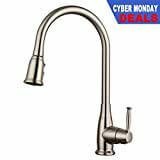 Overall we have considered the faucets listed above as the best pull down kitchen faucet because of the features that each model has as well as great rating they have received from various review sites. We are sure that picking of any model listed here will suit your needs and give you the best value for your money. All the best! Today there are many faucets for the kitchen on the market. Therefore it’s making it hard for you to pick the right choice. These models come with unique design and finishes that will catch your eye, and you would want to buy them instantly. After doing a wide research as well as reading the kitchen faucet reviews online, we have come up with a list of the best brands in terms of performance and durability. Any great kitchen should have a high-quality faucet that matches its style and décor. Although the market is saturated with many faucets, there is a great gap between the levels of performance among the faucets. For this reason, we have prepared a list of the top quality kitchen faucets that will be worth every penny. Here are our top kitchen faucets that will not only make it easy to wash your utensils but also adds style and aesthetics to your kitchen. This is another kitchen faucet that comes with a breathtaking design and awesome finish to complement any modern kitchen style. The docking system features an inbuilt magnet that allows you to attach the spray heads for better performance. The diamond seal technology backed valve ensures durability and leak-proof. Other great features that come with this model include the Touch clean spray holes. It makes it easy to remove the mineral buildup as well as the pull-down spray wand that allows you to direct pressure on dishes for an easier cleanup. The model features well though design which allows you to operate it with a simple touch. The arch is positioned at an ideal height, thus you will not have any problem when washing pots and other big utensils. The pullout sprout design prevents splashes when washing dishes while the 360-swivel feature makes it convenient to use. Customers who have already purchased the model are also happy by the fact that it is very easy to clean the surface of the faucet, removing any bacterial accumulation and mineral deposits. 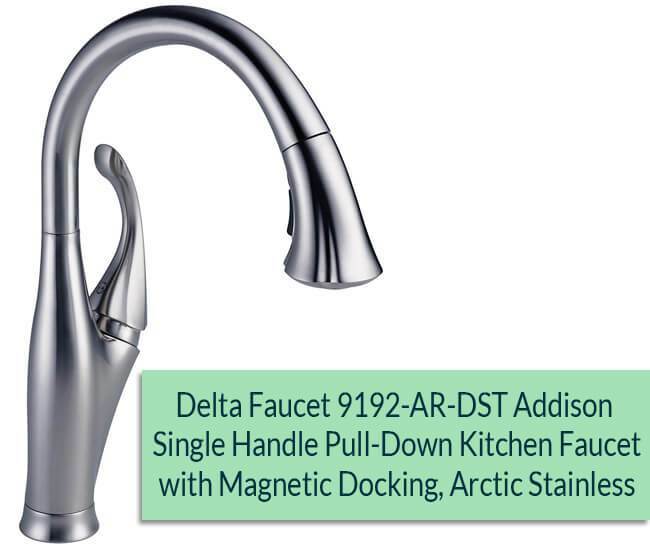 The 9192-AR-DST is another magnificent faucet from Delta that is constructed with the user needs in mind to ensure durability, ease of use and great performance. This model features the diamond seal technology that allows it to deliver great performance while still ensuring that it lasts for a long time. The model also comes with the convenience of the multi-flow wand that toggles from high flow to spray. Additionally, the high arc spout makes it easier to fill containers with water as well as cleaning larger utensils. 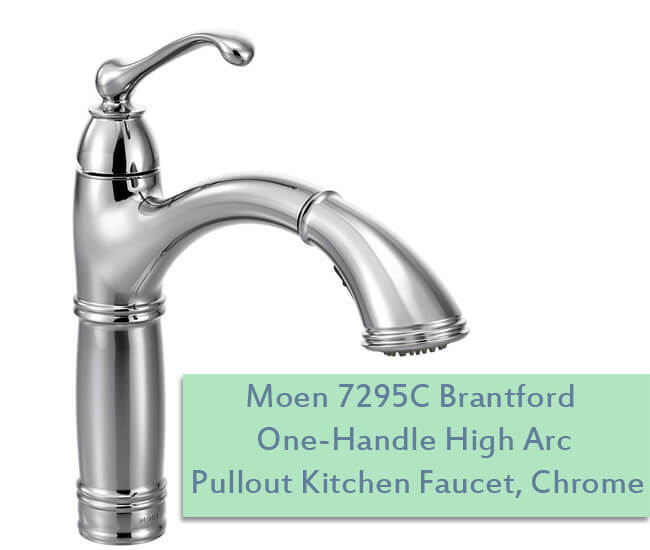 Moen 5923SRS Align Faucet adds a taste of class to your modern kitchen with its eye-catching design. The model features a spiral spring down the pullout handle that offers great flexibility when doing the dishes. Another reason to opt for this best kitchen faucet is the high end and steady construction that will match well with any kitchen décor. The single handle also makes it easy to control the water. Additionally, the aerated steam makes it convenient for everyday cleaning as well as suitable for heavy duty cleaning. If you are on the lookout for a premium faucet that guarantees you with maximum performance and aesthetics to your kitchen, this model will not disappoint you. The model is fitted with a reflex system that makes it easy to move, facilitates secure docking as well as smooth operation. The pullout design delivers customized water jets allowing you to clean your dishes briskly. You will also love the duralock quick connect that makes it easy to install as well as the one lever handle for one hand operation. 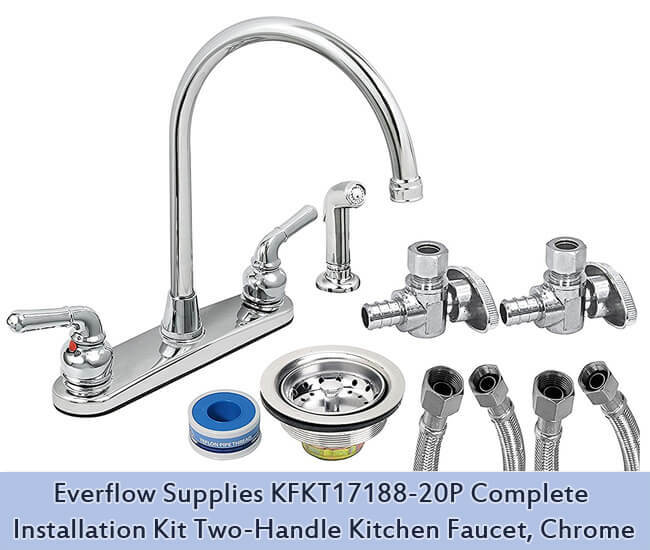 Everflow Supplies KFKT17188-20PKitchen Faucet is another model that offers better features than most people tend to think. One of the reasons why we have included it on our list of our best kitchen faucets is the two-handle design that creates an impressive look in your kitchen. The premium finish also gives your stylish kitchen look. The swivel sprout is quite efficient while the sprayer with a braided hose will get work done quickly. Additionally, this model features a high arch design that provides you with an easy clearance allowing you to get access to the sink fast. If you are thinking of replacing your old faucet with a modern and effective faucet, you can never go wrong with this model. Constructed using solid brass, this faucet will offer you with reliability you can depend on for many years to come. The product also features a chrome plated finish that makes it corrosion resistant as well as scratch resistant. This means it will remain in top condition for a prolonged period. You will also love the easy to operate single handle that will suit a simple and elegant kitchen. Featuring lead-free all metal construction, this faucet offers you with great performance with minimal maintenance. One feature that makes it unique is the high-end commercial style design that ensures long-term durability. 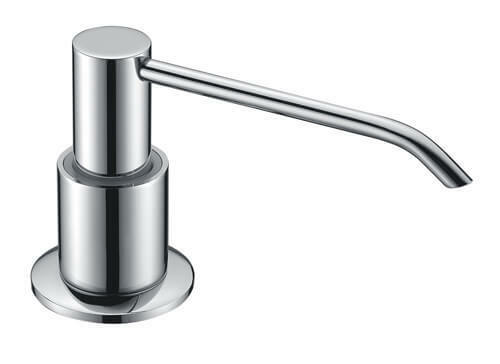 The faucet also utilizes a single lever flow that allows you to operate it easily. For ultimate functionality, this model also includes side pot filler that allows you to round out all the luxurious features. Additionally, all the mounting items are included, meaning you will not incur additional costs to purchase other mounting supplies. This faucet features solid brass construction and ceramic disc valve rendering it not only rust proof but also scratch resistant. The spout swivels 360 degrees all around allowing more flexibility while cleaning the dishes as well as preparing the food. The product also features a pull-down spray mechanism whereby you can customize the spray pattern so that it can fit your needs. 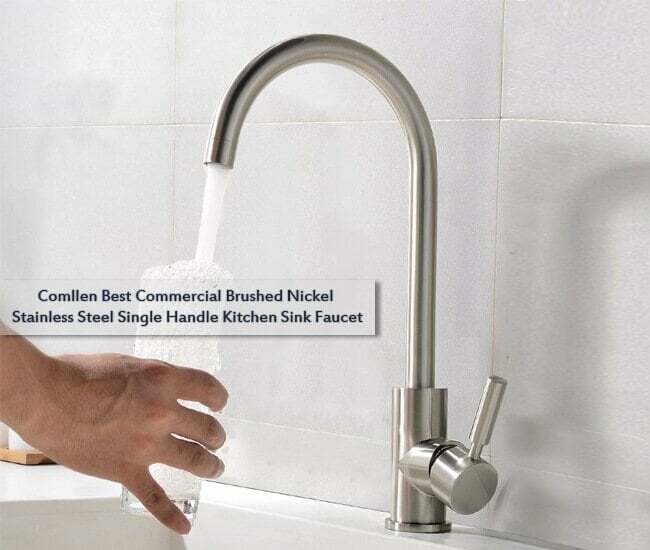 Some of the other features that make this faucet unique are the one whole installation, fully equipment of accessories, pre-assembled tap body, as well as one key control. 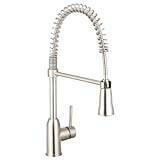 BOHARERS Touchless Kitchen Sink Faucet comes in a stylish design that will complement any kitchen style. The high arch design arch has the ability to swivel 360 degrees for convenience. The Sprout will offer you with an aerated stream for everyday cleaning as well as a powerful rinse. The motion sense operation also delivers great hand-free convenience that allows you to do your chores efficiently. Additionally, the waterproof feature plays a major role when it comes to using water efficiently since the water will flow only when needed. Lastly, the metal construction, as well as plated finish, enhances its longevity. This faucet has a very fine finish of brushed nickel and stainless steel making it not only rust resistant but also resistant to scratches. This adds a sense of style and sophistication to the décor of your kitchen. The one hole installation mechanism makes it super easy to install. The single handle also facilitates easy control of the cold and hot water while the 360 degrees swivel sprout allows for drip-free and smooth water flow. 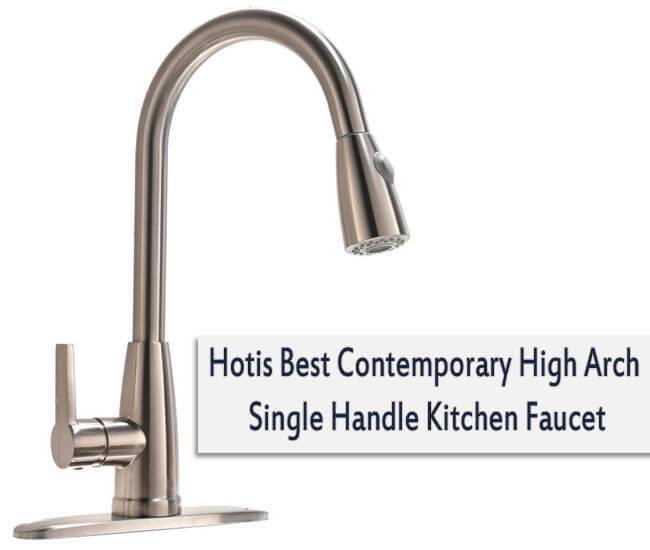 Although this is an entry-level faucet from Hotis Home, this model offers you with great features that you will find in other expensive models. The 360 degrees rotation coupled with high arch spout ensures there is more room for pans and pots as well as ensuring superior clearance for the sink. Another great feature of this model is the extended warranty. Products with extended warranties tend to last more and offer a reliable service. The brushed nickel finish also gives the faucet a gorgeous look while still making it scratch and corrosion resistant. 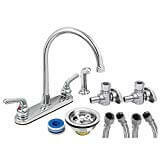 This is another entry-level faucet that comes with all the features you may need in a high-quality faucet. The model features high-quality finishes that not only resist corrosion but also is tough enough to withstand repeated use for many years. The two water mode feature also makes it exceptional. This includes the pullout spray head that allows you to either select either stream or spray mode. This is also an inexpensive model for anyone who is looking to replace their old and low performing faucets without breaking their banks. 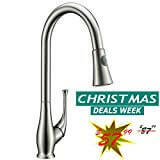 The list of the best kitchen faucets could not be completed without including the Pfister GT529WH1S Wheaton Faucet. This model has very many positive reviews for its performance and surface finish. Its impressive design will upgrade the look of any kitchen style. The well-made spout swivels 360 degrees allowing you to do your dishes easily. Additionally, this model features smooth adjustments for the waterpower in a more customized manner. If you are looking for a model that comes with impressive quality and long-term use, this is a worthwhile consideration. This is a safe, lead-free kitchen that comes with an impressive design to give your kitchen a classy and stylish look. The model comes with a single lever mechanism to allow you to regulate the water flow using one hand. Besides the breathtaking design, this model comes with an impressive finish that makes it stand out. Additionally, this premium ceramic designer faucet is easy to control to achieve the water jet pressure you prefer to for cleaning dishes. It is also an affordable model that does not compromise. Available in an elegant design and finish, this faucet is built to ensure that you have an easy time in your kitchen. You will love the cast brass spout. It is not only durable but also ergonomically designed to facilitate water efficiency. The product is also fitted with ceramic disc valving that ensures drip-free performance. 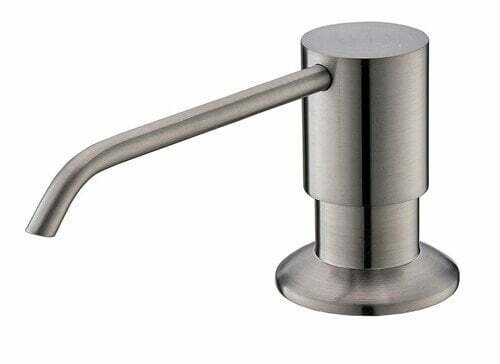 There are also well-designed vandal resistant lever handles that have a cold as well as the hot indicators. Installing the model is easy as for avid DIYers since all the installation equipment is provided. Additionally, this is one of the most affordable models making it ideal for clients looking for high performing faucets at an affordable price. Each of the products listed in our best kitchen faucets is tested and proven to offer high quality and long-term service. Choose any of the products listed above, and it will be worth every dime. However, before making your final decision, go through the features and pick a model that will best suit your needs. Getting a perfect look in your kitchen can be hard to achieve especially if you do not install quality kitchen faucets to matches the décor of your kitchen. 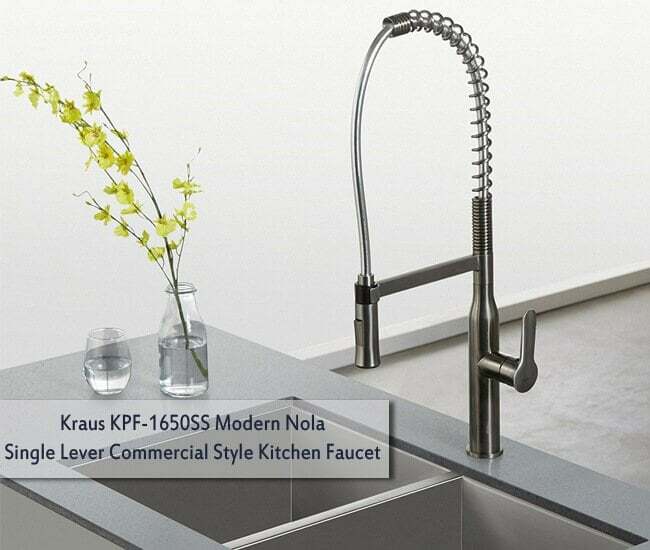 The kitchen faucets will complement your modern kitchen to give it an impressive look. Having look at our guide to getting all the information will guide you in selecting the quality kitchen faucets. This popular company has produced high-quality faucets for more than 50 years. The manufacturer offers well-designed and functional faucets at an affordable price. The company offers a wide range of electronic and touch faucets that are backed by a five years warranty. This is another high-end brand that offers faucets that come with stunning looks. The faucets are well designed and build to last. Additionally, the manufacturer offers their faucets with impressive finishes that are patented. These include LifeShine non-tarnish, Stainless, and SporResist Brushed Nickel. 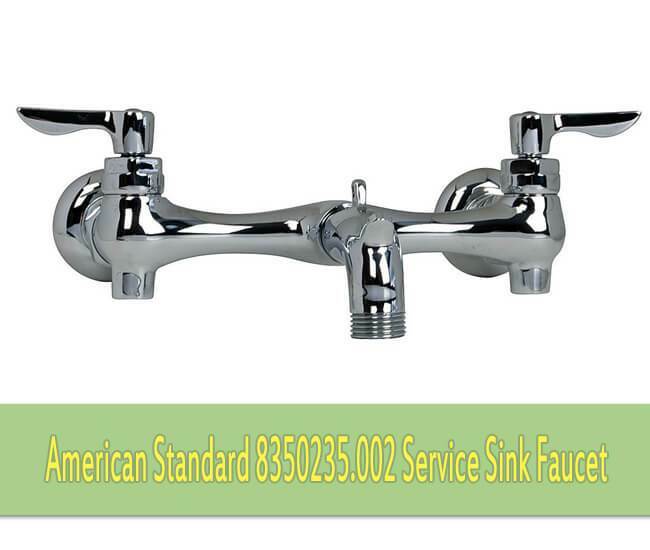 American standard company has gained a lot of popularity in the last couple of year because of offering inexpensive faucets that offer excellent reliability. Their products are also easy to install and use. The company offers a great customer service. This is always helpful, as it will give you any advice you need concerning their faucets. They mainly use brass to construct their faucets making them very durable. Kohler is a well-known company that makes use of special trademark feature to gain an edge over the competition. 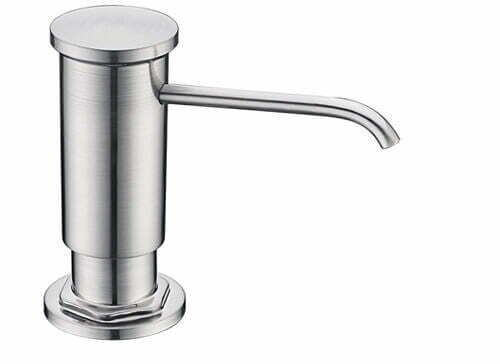 The company usually manufactures high-end pullout faucets. They are not only highly functional but also comes with an ergonomic sprayer that makes them easy to use. Although this company is relatively new in this field, it produces high-quality faucets that go head to head with models from the most popular brands. Another reason why you may consider this brand is that they offer their products at an almost half price of similar faucets from other well-known brands. This makes them a great choice for individuals who are looking for high-quality faucets at an affordable price. Pfister is also a recognized brand when it comes to the faucet industry. This brand produces models that feature an industrial look and stylish design that will fit perfectly in any modern kitchen. The company has more than hundred years’ experience in this industry and produce innovative and high-quality products at an affordable price. Grohe is a US-based company that offers high-quality faucets. The models are not only ergonomic but also come with numerous features, making them easy to use. The faucets come at different prices with some of them being true bargains. Their products come with a limited time warranty. Faucets for kitchen usually get a lot of use, so it is crucial for you to find a model that stands up to everyday wear and tear. Here are some of the considerations that you must take into account for you to get a model that you will suit your needs and still complement your kitchen’s style. Although most of us are concerned about how much water we use because it leads to more expenses, it is good to realize that water wastage is also bad for our environment. The best faucets for your kitchen should be water-saving designed for more efficiency. The water should also have enough pressure to clear the dirt quickly. The centerset are specially designed for basins that usually have three holes. They also have handles set about four inches apart. The centerset combines a spout and handle on a single base unit although some of them may feature two handles that are mounted onto a six-inch plate for more stability. Single-Hole Deck-Mount may come with either two handles or a single handle. A deck plate is then placed at the base of the faucet so that you can install the faucet in your kitchen sink. This is the most common mounting mechanism in many kitchens as it makes washing the utensils easier. A wall mounted kitchen faucet has no connection with the kitchen sink as they are fixed separately. The design makes it easier to fill large pots and vessels. They are suitable for no hole sinks or under mounts sinks. In this installation, the handles and the faucets are mounted individually to the countertop or sink without the use of a deck plate. The installation requires multiple holes on the sink or countertop. 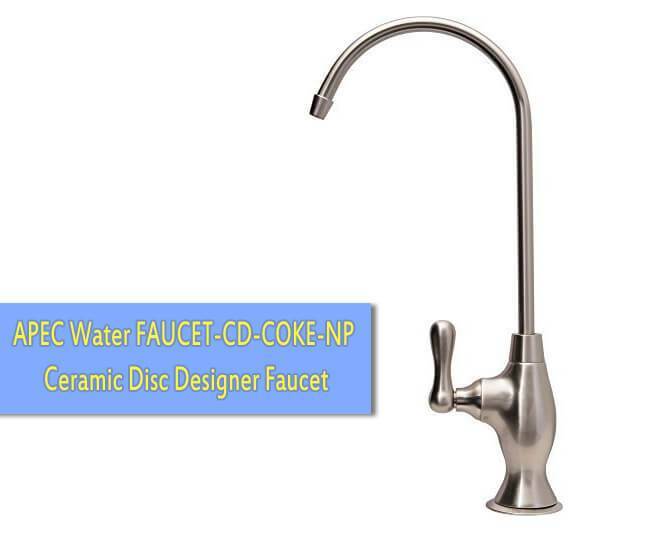 They are also referred as non-deck plate faucets. 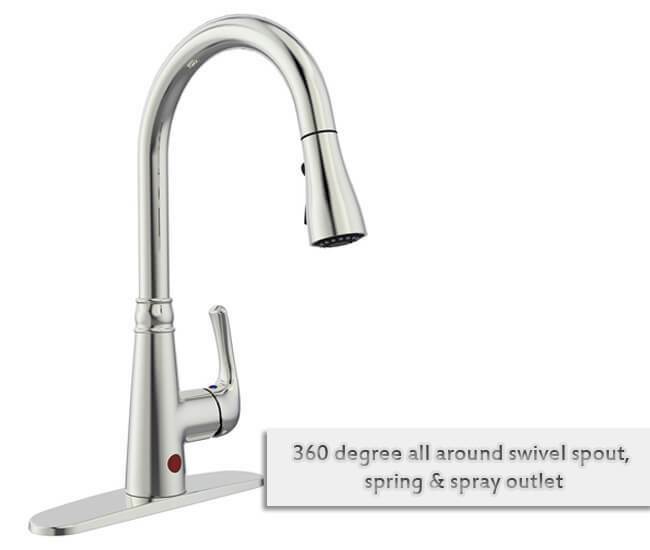 Another consideration to make when selecting the best kitchen faucets is the sprayer style. A faucet with a great sprayer will help you when washing and rinsing your ceramic cookware as well as the stainless steel cookware. The heads of these faucets usually pull straight down towards the bottom of your sink. This means that you can pull the spray wand to increase its reach. This will give you more flexibility when doing your dishes as well as wash the ingredients to cook. This is another style where the head of the faucet is pulled towards you. This will make it easier for you to fill the vessels that you usually keep on the sides of your sink. These faucets for kitchen usually have an additional spray that is fitted near the faucet. This type of spray will require an extra hole in the sink for installation. It makes washing the dishes easier. When going through the best kitchen faucet reviews to choose a model that suit your needs perfectly, pay attention to the design of faucet. Ensure that you go for a model that will complement the look of your kitchen. Most of the modern kitchen faucets come in various design. It makes it easier for you to pick a model that will work perfectly. Regardless the design you decide to select, ensure that it will be easy for you to use. As much as you would want to select the best-looking design, ensure that it is compatible with your sink or countertop and give you all the functionalities you need. An escutcheon is an optional accessory that acts as a decorative plate that will cover the extra holes in your sink. If you have one-hole setups this accessory will help you to cover, the remaining holes to give your kitchen sink a better appearance. The best kitchen faucets usually have this feature to make them look professional. Faucets cartridges are responsible for regulating the water flow and controlling the temperature by manipulating the lever. The cartridges are the most common pieces that are worn out when your faucet becomes leaky. They are inexpensive and easy to replace. These are plates have clay circle valve and a single lever over a wide around and hollow body. The construction material is usually solidified clay that is durable, meaning that is will last for a long time. The fixtures feature a wide lodging cartridge that usually has two artistic circles that slide over each other in order to blend the temperature and control the water stream. The aerator is one of the one of the overlooked part in a kitchen faucet. This piece has several uses but mainly act as the last line defense that controls the steam of water. This piece also prevents water from splashing as it shapes water to correct steam, especially when using the spray head device. Additionally, the filter side of the aerator is responsible for increasing the water pressure in areas where the water pressure is low. 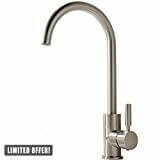 Single handle faucets come with one leaver that you can turn to one side for hot water and another side for cold water. 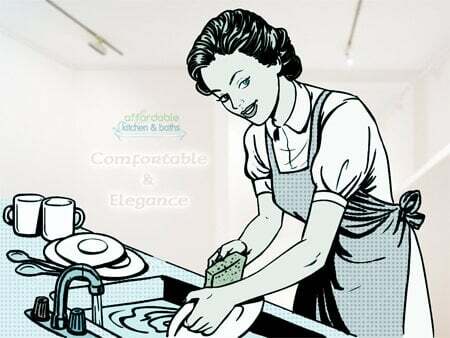 They are easy to install, take less countertop space and simple to operate with one hand. Two handle faucets feature two handles one for hot water and the other one for cold water. The advantage of these over the single handle is that they offer precise temperature control. There are wide varieties of finishes for you to choose when it comes to selecting the best kitchen faucets. One of the most popular finishes available is the polished brass as it offers both a high-quality finish and a timeless look. For a darker look, oil rubbed bronze is a great finish that is great for a traditional style kitchen. 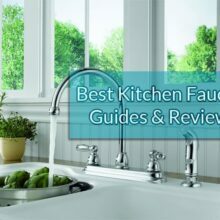 If you are trying to decide on the best kitchen faucets for your home, then this guide is detailed enough to help you choose a perfect setup for your kitchen. For those who are planning a self-install, get all the materials ready and read the manual before getting to work. Ensure you also go through our best kitchen faucet reviews to give you more insights that will help you to make the right decision. A ladder is an essential equipment that every home need. From DIY home improvement projects to major constructional work, a homeowner cannot do without a sturdy, reliable ladder. The home improvement market is full of various ladders that help you achieve specific project requirements, but rare do you find a ladder that is versatile enough to fulfill all present and future home needs. 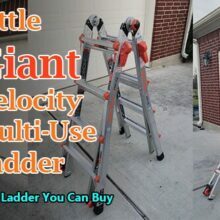 The Little Giant Velocity ladder is an incredible multipurpose ladder with patent design, stability, and variability to service in all home projects. The Little Giant Velocity ladder came to us at the perfect time. We had been on a hunt to find a sturdy ladder that could be used for both our indoor and outdoor home needs. This Velocity ladder is fast to set up and has great stability. It can be configured into 5 different positions: A-Frame, Staircase, 90º, Extension, and Scaffolding. When we got the ladder, it was surprisingly a little heavier than we expected. However, this in no way made the usage of this ladder difficult. 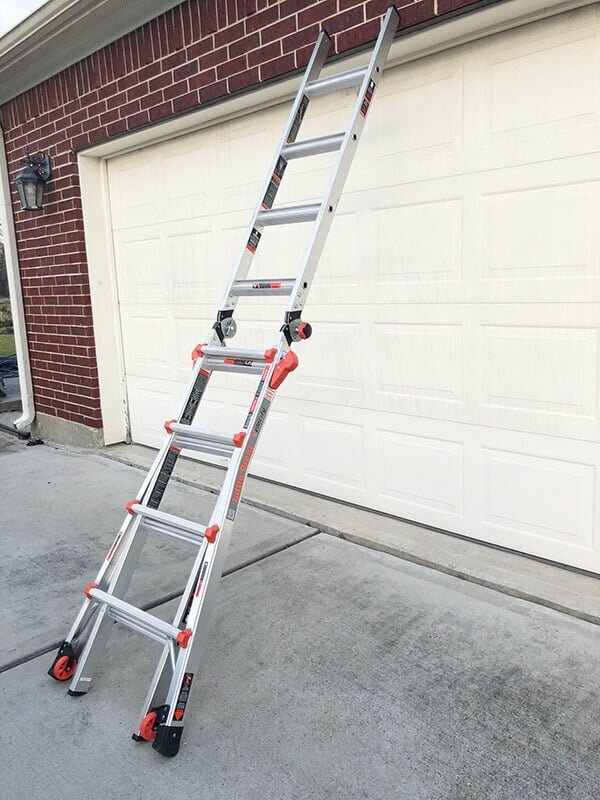 The ladder features glided wheels attached at the bottom that made it very easy to maneuver around the house and outdoors. One of the great perks of this ladder is how easily you can switch from one configuration of the ladder to the next with adjusting the rock and hinge locks located on the sides of the ladder. This ladder came to great use during a few of our recent home projects. We had recently bought some window blinds that we needed to install on our 8-feet custom windows. This ladder in A-Frame position provided absolute stability and ease when working on the blind installation. It was great to concentrate on getting the blinds fixtured and not worry if someone was going to fall off. We also had two people on this single Velocity ladder with no issues in the ladder losing ground, proving the Little Giant’s claim of being able to support up to 300lbs. During our blind installation, the 90º mode was excellent to switch to. With just the rotation of the rock and hinge locks, this mode allowed us to get close to the wall of the window ceiling and screw on the necessities for the blinds. In both of the next two projects, the extension mode of the ladder came to excellent use. Our first outdoor project was to trim our palm trees. We had the ladder extended out against the palm tree, and the sturdiness it proved while climbing up the ladder stairs, was excellent. There was no shakiness. There was no imbalance. Climbing up the top of a palm tree has never been easier. It was incredibly satisfying to trim the leaves and not worry about anyone’s safety. We finally decided to use the ladder to check out the condition of our roof. This project, again, with the Little Giant velocity ladder was made easy and swift. The ladder locks in securely and does not budge at all while you are at work. It was easy to grab this ladder and open it up, and quickly check out the roof repair and then put it all back together in a sturdy safe lock. The build of the Little Giant is what sets it apart from all other ladders. The air-craft- grade aluminum construction makes it 20% lighter than its competitors. It comes with tip and glide wheels that make for easy transportation. The ladder has wide-structured legs and double pin hinges that provide ultimate stability and safety at all times. The velocity ladder comes in four models: 13, 17, 22, and 26. Its also available on the Little Giant Ladder website and comes with a full lifetime warranty. Our experience with the Little Giant Velocity ladder has been nothing, but positive. It has proved to be an excellent home improvement tool in our home with its versatile modes and undeniable stability. It has performed great inside the home to complete mundane tasks such as cleaning out the home ceiling fans and mounting window blinds. Equally, it continued to be easy to use when working outdoors to check the roof and trimming the palm trees. All in one, anyone who uses the velocity ladder will agree that it is unlike other ladders when it comes to fast set up and safety. 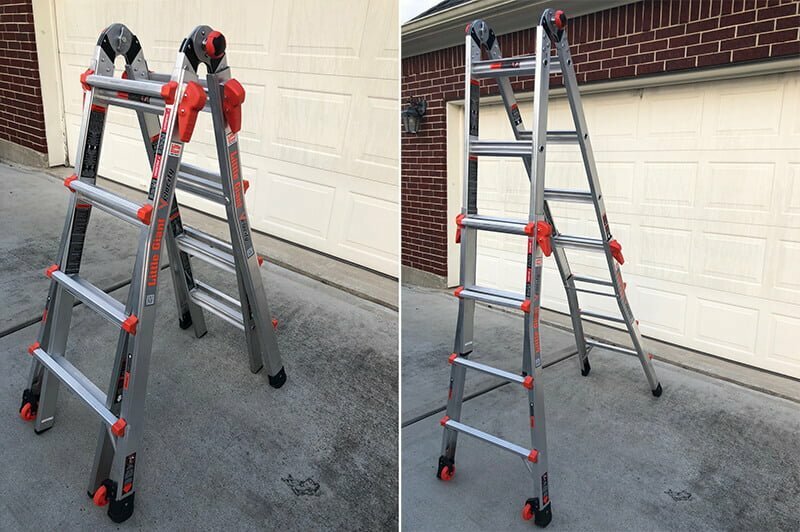 This ladder is an excellent purchase for any homeowner that needs to get the outdoor and indoor work done quick. It is a timeless tool that will serve you and your home for many years to come. In order to keep your sink free from clogged drains, you need a sink strainer. It should be able to catch all the little pieces of food from the dirty dishes and allow the water to flow free too at the same time. If you are looking for a sink strainer, below are the best sink strainers that are reliable and prevent your drain from clogging. It is a high quality sink strainer and worth the money. We're a bit reluctant to try this product, but after reading its features, we put it in our list. The premium feature of Everflow 7513 is the solid brass body. It ensures that it is a durable product and will be a lifelong friend. In addition, the heavy duty stainless steel makes it dishwasher safe. Due to its appearance, we expected something heavier, but this isn't the case. And, it doesn't mean it is not sturdy either. 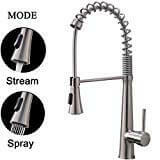 It is a quality product from the professional manufacturers of Moen that offers stainless steel finish that complements contemporary kitchen decor. It is also backed by limited lifetime warranty against leaks and drips. Therefore, your investment is safe in the long run. I've personally installed this unit in my own kitchen too. It is one of the best sink strainer which I've ever installed as a homeowner. It is all metal with top-notch quality. You can install it on your own. All you need is an adjustable wrench. Bear in mind, you don't require plumber's putty to install it. It has foam gaskets that make the entire installation process easy. Therefore, I will say it as one of the best sink strainer. If there is one product that deserves the best-seller ranking in the list, it is Kohler K-8799-SN Duostrainer Sink Strainer. We agree, there aren't too many reviews for this masterpiece, but we have seen how it operates. It has an easy-to-use open/close stopper that makes your life easier. It is tough to find this feature in other products. Also, the stopper assists in sealing the strainer tightly. You don't have to worry regarding its looseness. Want a perfect compliment for your sink? Get Kraus Kitchen Sink Strainer. It is one of those models that define elegance in the most suitable manner. 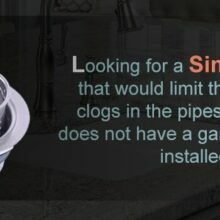 But, there is one thing you need to remember, which most consumers don't notice before opting for this sink strainer. Its white base is visible through the drain hole. For that reason, make sure it is complimenting the sink or the overall design of your kitchen. It is a professional-level product that won't get scratches even after years of use. If you are tired of changing strainers again and again due to scratches or damage, this is something you definitely need. Don't question its quality because of plastic material. It is exceptional and looks great. Other than that, it comes in oil rubbed bronze which gives your sink a lavish and modern look. If you want a sink strainer with removable separate deep basket, K.ONE Company has a gift for you - KONE Kitchen Sink Strainer. Its removable separate deep basket not only prevents the debris, but also allows you to clean it without any trouble. You don't have to deal with clogging issue time and time again. Even if there is some stuff in the basket, the water will still flow easily. This is also almost similar like the KONE Sink Strainer. The only difference is it is from the Oakland Company. It is a perfect fit for almost all standard kitchens. No need to worry regarding its installation too. You just need a screwdriver to install it. However, before buying this product, you must keep its dimensions in mind, which are 4 x 4 X 4 inches. When we compare KES Kitchen Sink Drain Stopper with other products in the market, it challenges them on a big scale and in so many aspects. For example, its basket can hold far more stuff than an ordinary sink strainer. 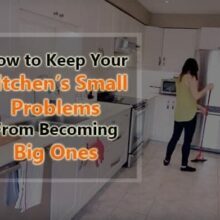 If you deal with a lot of dirty dishes, or if you are planning to buying something for your restaurant kitchen sink, this will definitely exceed your expectations. Wish to have both convenience and style? Westbrass developers have something amazing for you - Westbrass R214-12 Post Basket Strainer. Because of its movement, you can decide how you can want the drain to work. For example, just lift it a little bit to drain the water quickly. On the other hand, if you would drop it, the draining process will be slower. Its classical design is perfect and suitable for most American families. The best thing is its material protects it against corrosion and rust, which is a big issue when it comes to strainer. It doesn't matter how great a strainer is, if its material can't handle the rust or protects it against corrosion, it is good for nothing. Therefore, the Gzila Company focused immensely on this aspect to ensure longevity of their strainer. As the name suggests, it is a stainless steel product. Though, there are many other strainers in our list which have stainless steel body, the thing which make Everflow 7516 different is it comes with a extra thick 8mm rubber locknut. The manufacturers introduced this feature specifically in order to make it a lifelong product. Furthermore, they tried their best to give a contemporary look to match even the most modern kitchens. The sink is the heart of the kitchen, if you don't know how to buy the best strainer for it, you will destroy it soon. Since, the strainer handles most of the daily chores. It should be something which allows to flow the water easily and quickly, and catch the small debris and particles easily too. Apart from the strainer's own quality, the first thing you must consider is the size of the sink. Can you easily place or fix it inside the sink? Since, if you don't know the dimensions you need, it can be a lot of trouble for you. Almost all companies define the dimensions of their strainer on the product page. If it matches with what you need, get it. Second, must check how does it operate. Does it have a basket for containing the debris? And, if it has a basket, can you fit it inside your sink? Furthermore, do you need to clean the basket on a daily basis or you can do that after a few days, because the capacity of the basket matters a lot too. If you just focus on these two aspects, we are quite confident you will able to get the best sink strainer for your kitchen. In order to save money, it is imperative to focus on the material of the strainer. If the quality of the material isn't good enough, it means it can compel you to invest in it more and more and time and time again. Mostly, the stainless steel is in demand, but its properties also matter. For example, all the stainless steel materials don't guarantee long-term survival. You must opt for that product which is scratch resistant and prevent corrosion and rust too. It is because these things are your strainers real challenge. If your strainer can't deal with them with efficacy, it is good for nothing. Sink strainer looks simple and small to the eye, but it is an important component of your kitchen. If you have the best sink strainer in your home, it can save you from a lot of trouble. You don't have to replace it or spend extra money on the plumbing issues.